We dedicate this Conference to the methodology of the visit to the places of detention. We thought that after almost five years of existence of the Network, it is necessary to make a certain summary, to underline and to see the results of previous work. Our intention is to interxchange experiences and best practices of the control mechanisms in the conduct of visits to institutions where persons are deprived of liberty, said Protector of citizens Zoran Pašalić, opening a meeting of the Southeast Europe NPM Network with the topic "Methodology of visit to places of detention". Miloš Janković, deputy protector of citizens for the rights of persons deprived of their liberty and the chair of the Network, pointed out that there is a need to analyze in depth and address issues related to the planning of visits, such as the their types, composition of teams, visit principles, as well as guidelines and questionnaires for visits. 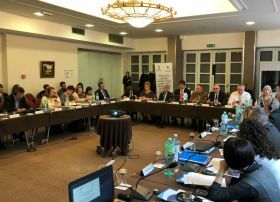 He pointed out that since the year 2012, the National Preventive Mechanism of the Republic of Serbia has visited about 500 institutions in which persons are deprived of liberty and made about 350 visit reports, in which nearly 2000 recommendations were sent to the competent authorities for remedying the observed shortcomings and improvement of the status of the persons deprived of their liberty.